Man I love this green goop! 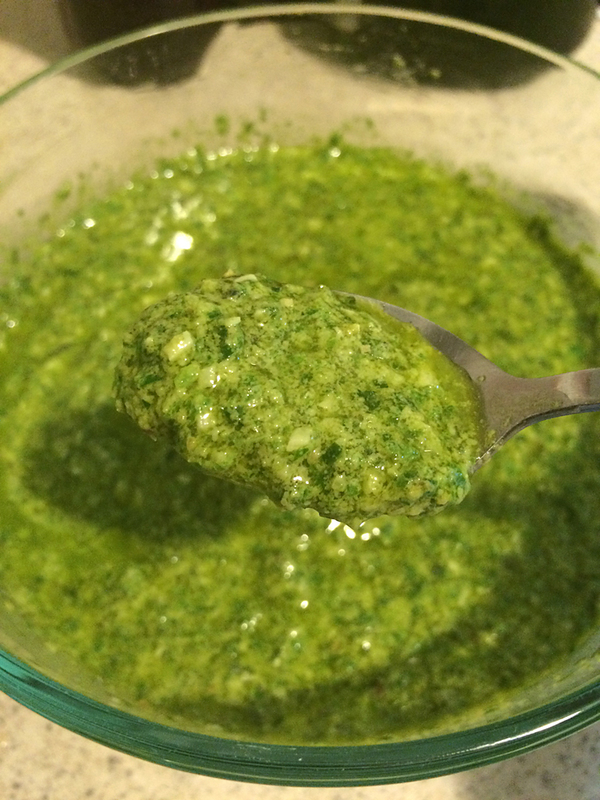 So mega easy to whip up in a food processor and makes anything super tasty. It’s my lazy go to when I’m making rice, pasta, chicken or veggie dish. As long as you have some good quality basil, garlic and olive oil, you can make this batch lickity split and freeze the rest for a later date. 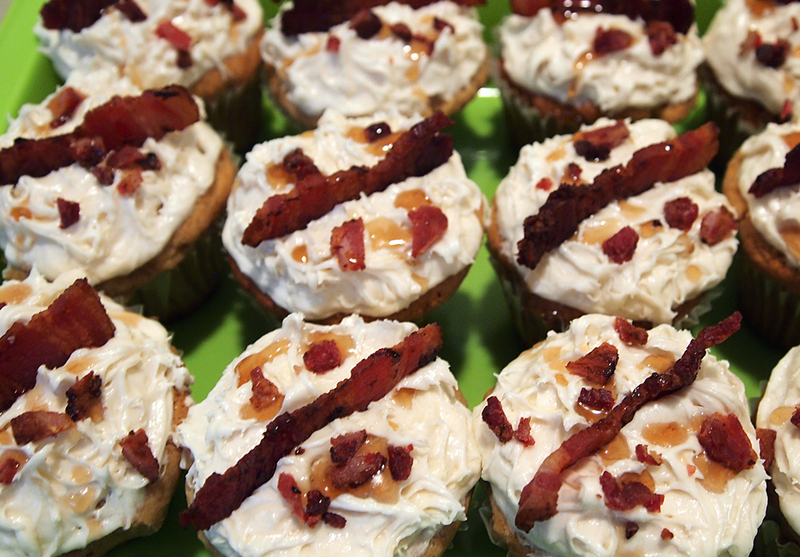 So like so many out there, I jumped on the bacon bandwagon and put the smokey meat on something sweet! 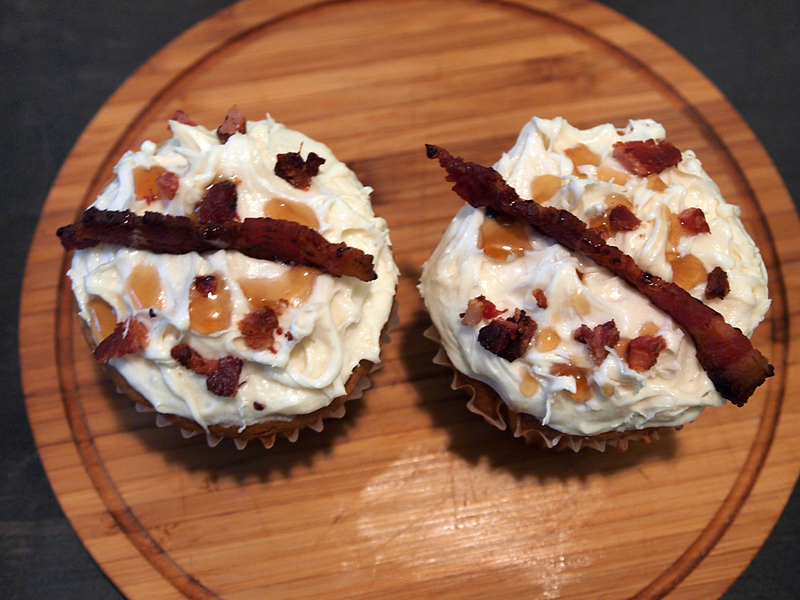 My friend’s birthday party was the perfect excuse to make these boy cupcakes, I’m not sure if I would ever make them for a girl….we don’t like bacon THAT much. Essentially I took a plain vanilla cupcake recipe, spruced it up with the addition of some maple syrup and added a buttercream frosting that also had maple in it. Fry up some bacon all crispy like and decorate at will. Categories Baked Good, Make Yummy Food! 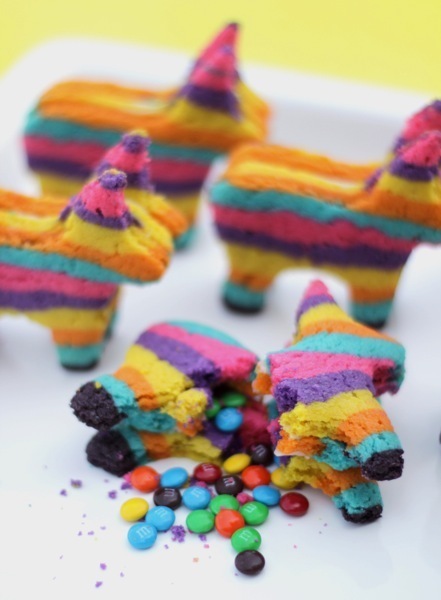 So my friend had a loosey themed NYE party and during a night of making awesome paper cutout banners, she told me about these crazy pinata cookies that I may just be crazy enough to make. She isn’t far from wrong, I looked it up….decided it was WAY too much work and way too much waste so I improvised and came up with something equally festive. 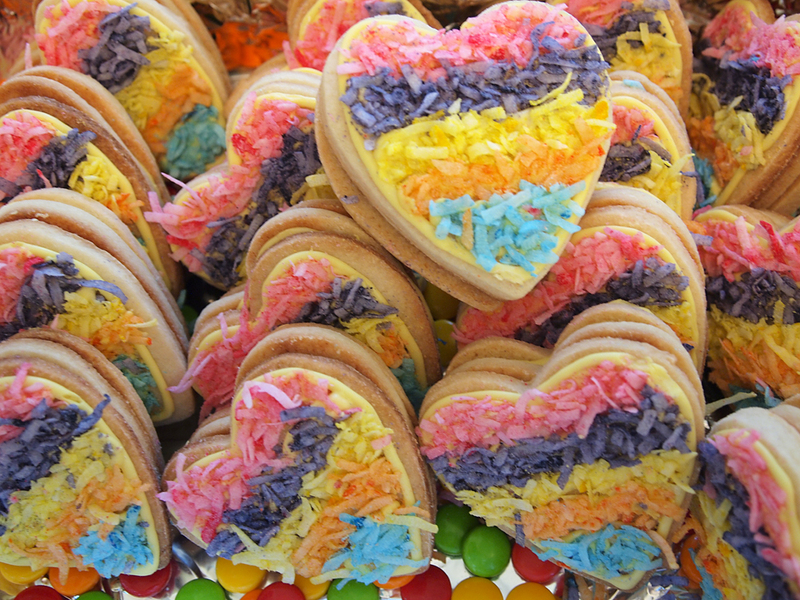 I mean they are way cool but also requires a lot of coloured dough and a lot of waste since you cut out the cookies after you’ve baked the slabs (to ensure equal sizing I assume). I came up with something else, they’re not perfectly shaped but meh…the coconut looks like tissue paper so I’m happy! No recipe here, just assemblage instructions! So….this is a hack of a recipe…it’s really not a recipe at all. I saw some beautiful pork belly at Sunrise Market a while back and had to buy some. Strolling around the aisles of marinades a plenty, I found a jar of char siu sauce to go with it. 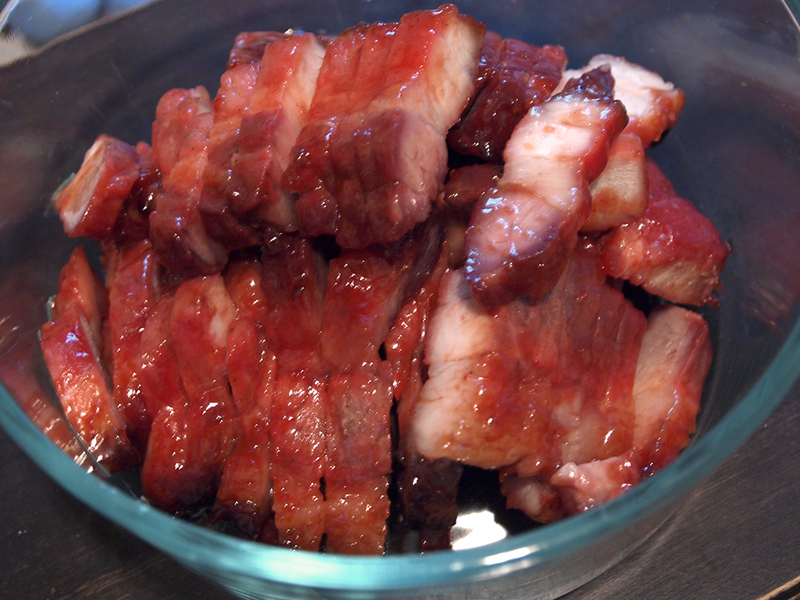 Slice the pork belly in 3/4″ slabs, mush some char siu sauce around it (helps to throw it in a big ziplock bag) and put it in the fridge to marinate overnight. Next day pre-heat the oven to 350 degrees and place the slabs on a raised rack in a pan. Air flow all the way around ensures even cooking and will lend to crispy ends. Roast for 20 minutes per side and than raise the temperature to 425 and roast for another 5 minutes on either side or until the edges get charred. Let it rest for 10 minutes, slice and serve…don’t you dare throw out the fatty bits! Wham bam thank you ma’am, easy peasey meaty goodness with minimum effort. Not only is it literally two ingredients but it’s fast and ultra satisfying, I can’t say that the sauce was 100% authentic, seemed a touch on the salty side and had a goopy-ness to it but nonetheless I’d make it again! 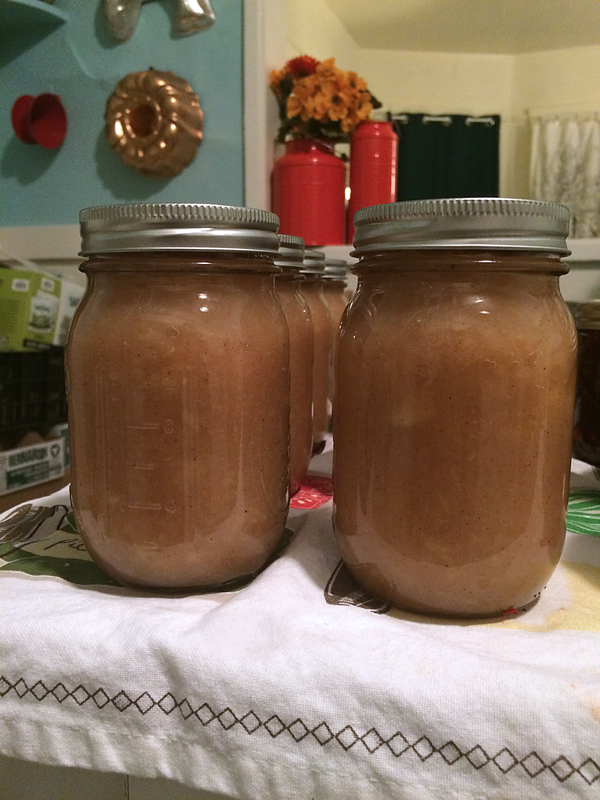 What do you do with 30 lbs of organic apples? Put them in jars obvi. 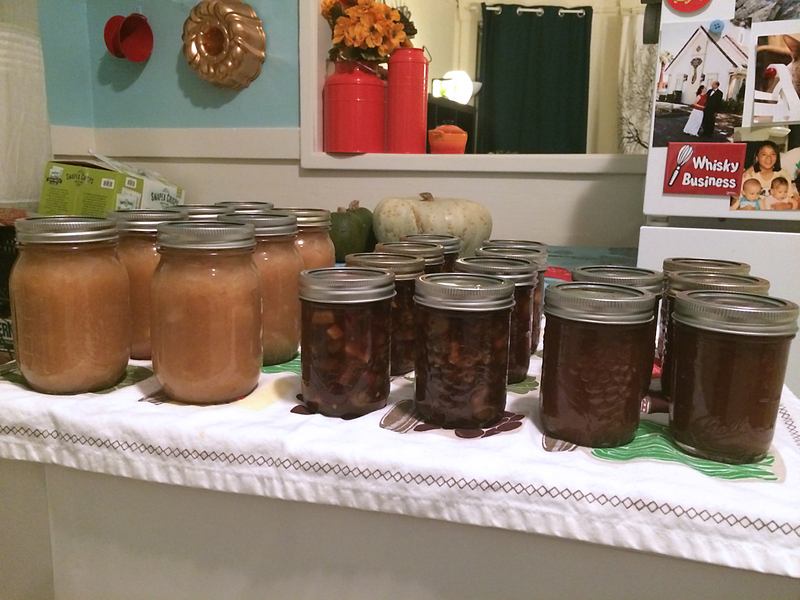 Seems like I can’t curb the excessive canning hobby so three recipes came out of this box, spiced apple butter, cinnamon applesauce and apple chutney. If you’ve got to process a ton of apples, this old-timey slicer/peeler/corer is completely essential! After a fun lesson on how to tell the difference between apple varieties, one of my fav friends took on the task of filling my 4.5 qt crockpot full of apples. We used a mixture of mutsus, galas and spartans, avoid hard apples as they won’t cook down as nice. I love when people help me with my madness! Turn the crockpot to low and basically leave it for 12-16 hours. After your house is filled with apple goodness, use an immersion blender to make it very smooth. I had some impromptu guests stop by for tea and was glad my house smelled so delicious! Add about 2 cups of sugar, juice of one lemon, zest of one lemon, 1-2 tsp all-spice, 1-2 tsp of cinnamon and reduce the whole shabang until the apple butter reaches about halfway in the crockpot. As you can tell, everything is loosey goosey, taste and adjust spices and sugar to your liking. Follow the hot water bath method as usual, process for 10 minutes. 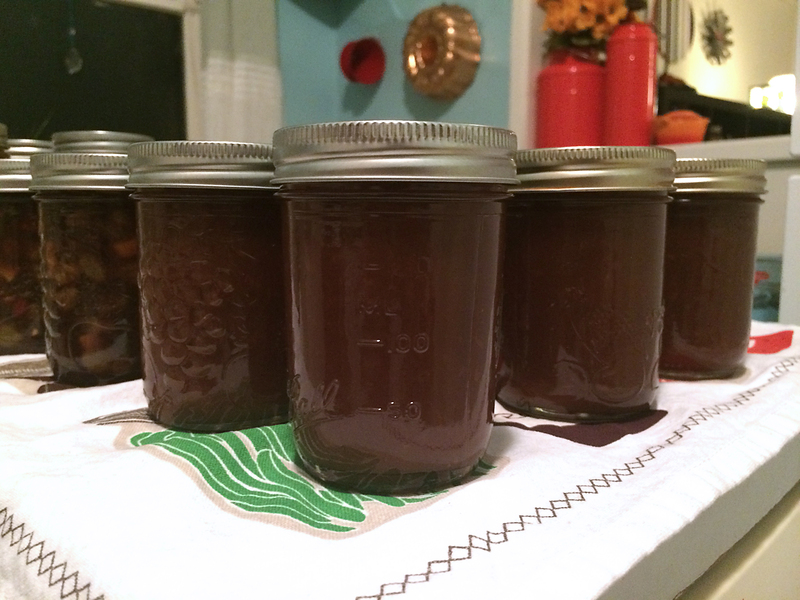 What the heck do you use apple butter for? It’s this uber concentrated caramelized apple flavour packed full of spices and zesty lemon. Put it on toast. Stir it in yogurt. Throw it into muffins. Use it instead of icing in cakes. My go to “I’m too lazy” food, open a jar of cinnamon applesauce and voila, instant snack satisfaction! I like applesauce that is a bit chunky so has a nice texture, plus I’m not an infant so I don’t need a puree. My rule of thumb is to use a mix of soft and hard apple varieties, the softer ones will cook down into mush and the harder ones will provide chunky bits. The most important tip is to use apples that are awesome, juicy, flavourful and sweet, forget using just granny smiths and then adding sugar to make it less tangy. I used a mix of mutsus, galas, spartans and fujis. 10lbs made about 8 pint jars for me. 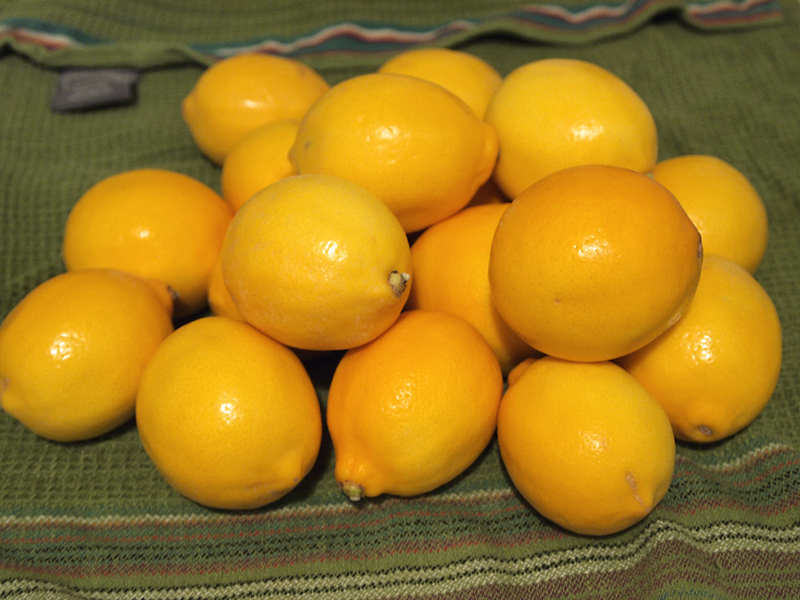 Throw all your peeled, cored, and chopped/sliced apples into a big pot and add a cup of water. Heat on high and cook until soft. Use an immersion blender to break it down as far as you like, ultra smooth to chunky. Add 2 tsp of cinnamon (or to taste) and can using the hot water bath method. No added sugar needed if you picked the right apples. Process for 15 minutes. 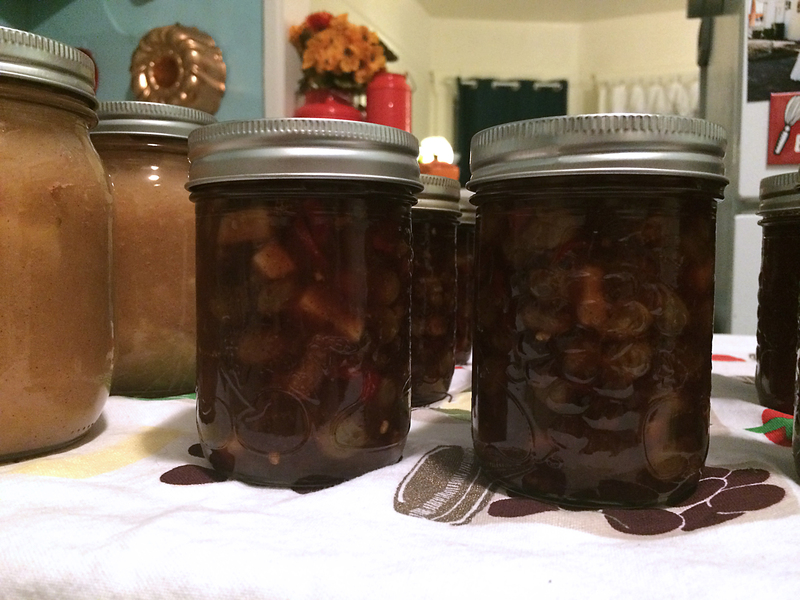 When this apple chutney is in my cupboard, I can’t eat pork or lamb chops without it! It’s a mixture of spicy, sweet, and tangy and it is quite potent so a little goes a long way. It’s pretty amazing on a cheese platter as well and goes great with Indian food. Throw all the ingredients in a big pot and cook it down until it’s the consistency you like. Use the hot water bath method and process for 15 minutes. 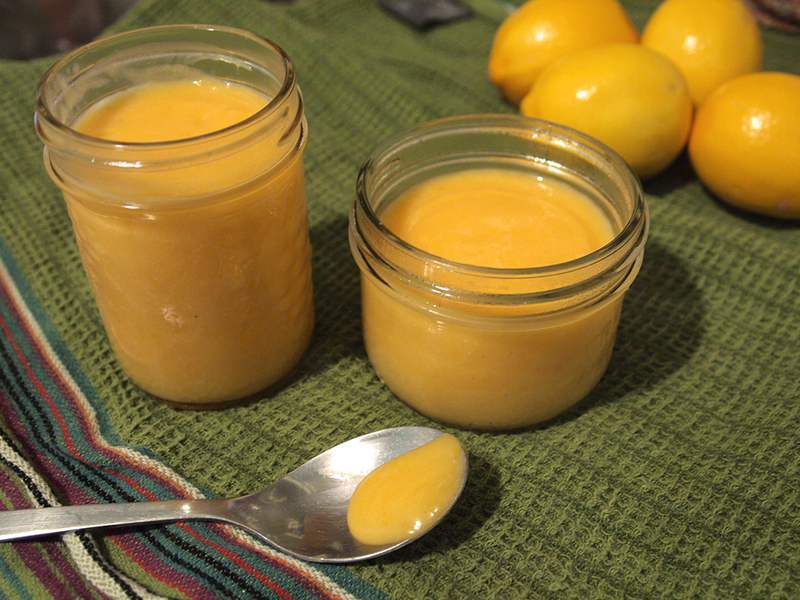 Done with apples for yet another year…now it’s time to dig into those canned summer peaches to chase away the cold and drizzle. I admit that these cookies are not my creation, my neighbourhood friend who stopped in to catsit for me once left these on my counter and now I love her long time. 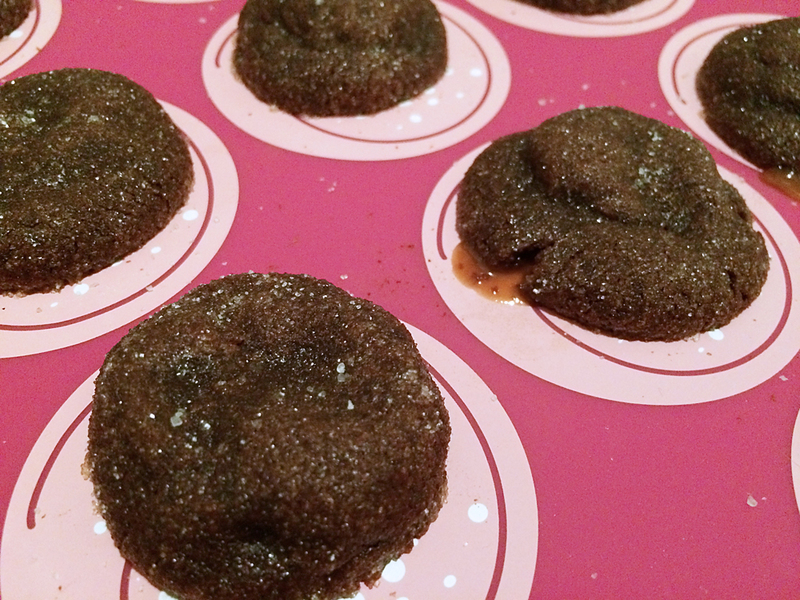 It is the perfect cookie, kinda cakey, soft and chewy, oozy caramel in the centre with a sprinkling of sea salt on top. They are easy but not as mega quick to make as drop cookies. A friend of mine had a cookie baking and drinking party not too long ago (there was way more cookie eating than actual drinking) so I decided these were probably pretty perfect for the occasion. Here’s the recipe (makes 40 cookies)!